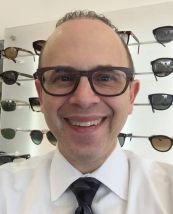 Dr. Barnstein, a Baltimore native, graduated from the Pennsylvania College of Optometry (now Salus University) in 1994. He attended James Madison University (1987-90) where he was accepted early into optometry school. Dr. Barnstein is therapeutically licensed to treat eye disease, and diagnoses and manages glaucoma. He also specializes in difficult contact lens fittings, dry eye disease, and LASIK co-management. Dr. Barnstein is a member of the American Optometric Association and the Maryland Optometric Association. Dr. Barnstein enjoys spending time with his wife, 2 children, and puppy goldendoodle. He’s an avid local sports fan, and loves live music.